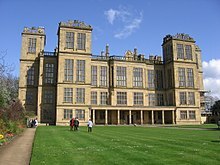 Elizabethan architecture refers to buildings of aesthetic ambition constructed during the reign of Queen Elizabeth I of England and Ireland from 1558–1603. Historically, the era sits between the long era of dominant architectural patronage of ecclesiastical buildings by the Catholic Church which ended abruptly at the Dissolution of the Monasteries from c.1536, and the advent of a court culture of pan-European artistic ambition under James I (1603–25). Stylistically, Elizabethan architecture is notably pluralistic. It came at the end of insular traditions in design and construction called the Perpendicular style in church building, the fenestration, vaulting techniques and open truss designs of which often affected the detail of larger domestic buildings. However, English design had become open to the influence of early printed architectural texts (namely Vitruvius and Alberti) imported to England by ecclesiasts as early as the 1480s. Into the sixteenth century, illustrated continental pattern-books introduced a wide range of architectural examplars, fuelled by the archaeology of classical Rome which inspired myriad printed designs of increasing elaboration and abstraction. As church building turned to the construction of great houses for courtiers and merchants, these novelties accompanied a nostalgia for native history as well as huge divisions in religious identity, plus the influence of continental mercantile and civic buildings. Insular traditions of construction, detail and materials never entirely disappeared. These varied influences on patrons who could favour conservatism or great originality confound attempts to neatly classify Elizabethan architecture. This era of cultural upheaval and fusions corresponds to what is often termed Mannerism and Late Cinquecento in Italy, French Renaissance architecture in France, and the Plateresque style in Spain. In contrast to her father Henry VIII, Elizabeth commissioned no new royal palaces, and very few new churches were built, but there was a great boom in building domestic houses for the well-off, largely due to the redistribution of ecclesiastical lands after the Dissolution. 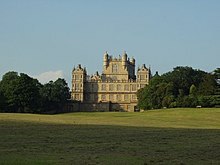 The most characteristic type, for the very well-off, is the showy prodigy house, using styles and decoration derived from Northern Mannerism, but with elements retaining signifiers of medieval castles, such as the normally busy roofline. Chisholm, Hugh, ed. (1911). "Elizabethan Style" . Encyclopædia Britannica. 9 (11th ed.). Cambridge University Press. p. 288. Wikimedia Commons has media related to Elizabethan architecture.